Naloxone Prices Are Up As Demand Has Increased : Shots - Health News With price hikes and rising demand, the drug naloxone, which can reverse an opioid overdose, is taking up an ever-larger share of emergency department budgets. 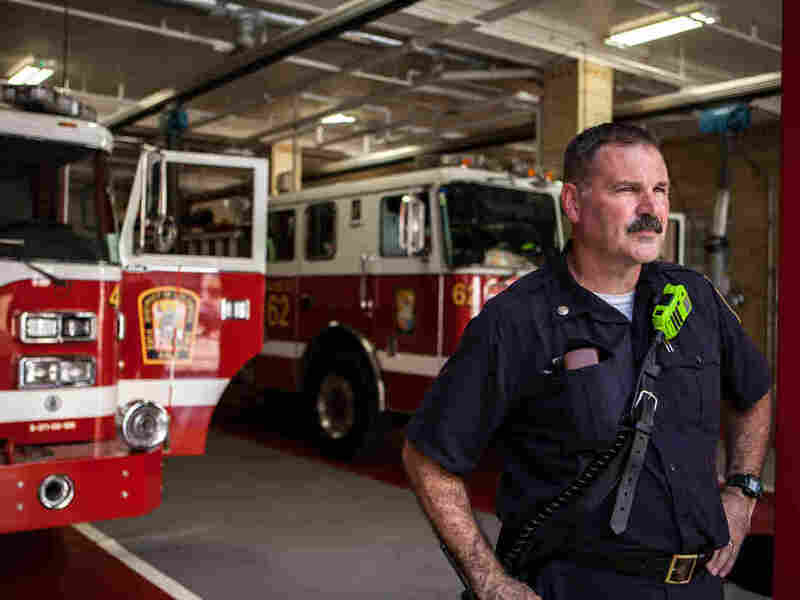 Battalion Chief Mark St. Laurent, seen here at the Franklin Square firehouse in Washington, D.C., says sometimes multiple doses of naloxone are needed to stop an overdose. The first responders in Prince George's County are pulling the drug out of the bag more than ever. Last year they administered 877 doses to people who had overdosed. This year, they're on track to administer 1,230 doses, Spies says. That averages out to more than three doses a day in just one county. In Washington, D.C., it's the same story. 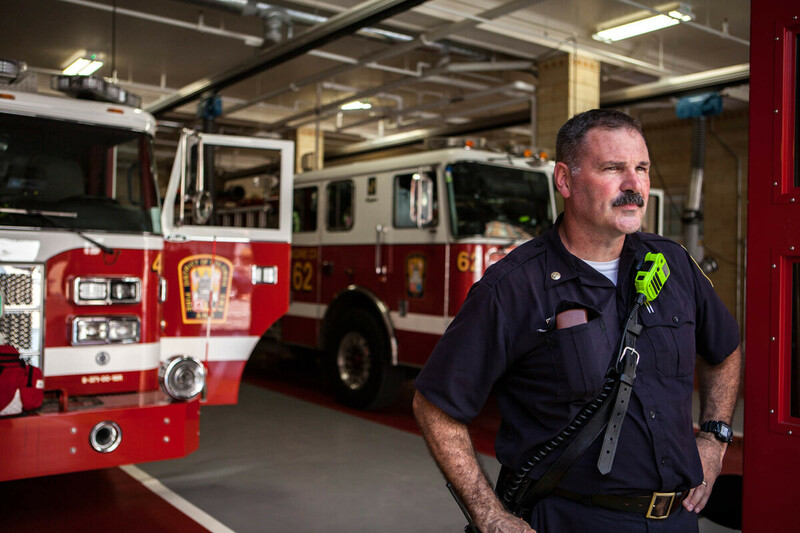 "Depending on the strength [of the opioid], you may see that we'd use two of these," says Battalion Chief Mark St. Laurent, holding up a 2-milligram vial of naloxone. If the patient has taken fentanyl — a particularly potent opioid — he says, "sometimes it takes 10 milligrams just to get them to breathe." Opioid addiction has reached crisis levels across the country. Overdose deaths from prescription painkillers and heroin totaled about 33,000 in 2015, according to the American Society of Addiction Medicine. Naloxone reverses the progress of an overdose and revives the victim so they start breathing again. It's been around since the 1960s but has become so ubiquitous in the emergency response arena in recent years that even the bomb squad in Prince George's County carries it — to safeguard their bomb-sniffing dogs. "Obviously, they're sniffing a lot of things in a lot of different places," Spies says. "So if they come across white powder or any type of the drug, the bomb team does have the naloxone readily available to give to the canines." Prince George's County will spend about $45,000 of its $600,000 equipment budget this year on naloxone. Spies says the price of the drug had been rising but has leveled off in recent years. The Washington, D.C., fire department confirms this. The city paid about $6 for a prefilled syringe of naloxone in 2010, says spokesman Vito Maggiolo. This year, that same syringe runs about $30. Maggiolo says the fire department spent about $170,000 on naloxone in the last 10 months. That worries Sen. Claire McCaskill, D-Mo., who last week sent letters to four pharmaceutical companies that make naloxone, asking them to provide details about the discount programs they offer to emergency management and public health agencies. It's part of an ongoing inquiry she launched last year with Sen. Susan Collins, R-Maine, into rising drug prices. 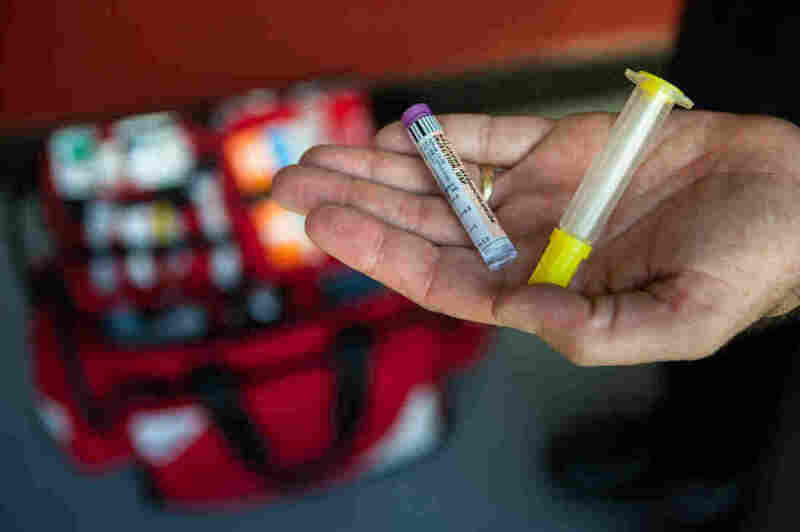 First responders in Washington, D.C., bring naloxone on every emergency call. "The rise in costs associated with acquiring naloxone has caused significant accessibility issues for those on the front lines of this epidemic," she wrote in the letters. The letters were following up on an earlier request about naloxone costs, in which the companies responded by saying they had donated doses and offered discounts on naloxone to first responders. The prices of some brands of naloxone have risen in recent years, according to an analysis by the investment research firm SSR Health for NPR. The price of a vial of generic naloxone made by the company Amphastar rose from about $4 in 2009 to about $16 this year, according to SSR. McCaskill was particularly concerned about a naloxone auto-injector called Evzio, made by Kaleo Pharmaceuticals, whose price rose from $288 per dose when it hit the market in 2014 to more than $2,000 this year. McCaskill sent the company a separate letter asking it to justify its price in February. Kaleo CEO Spencer Williamson said in a statement that no customers actually pay that much because of all the discounts and rebates the company offers. The company says it has donated more than 250,000 of the devices to nonprofit groups, fire departments and public health agencies. It says 3,600 lives have been saved by those donated devices. Not all prices are rising. Narcan is probably the best-known brand of naloxone. It's made by Adapt Pharma and comes in a nasal spray. The list price has been $125 since it went on sale in 2015, according to the company and SSR. Company spokesman Thomas Duddy says Adapt sells Narcan to emergency responders and other public agencies for $75 for a two-pack. "You get a sense of the premium being charged for the unique delivery mechanism," says Richard Evans, general manager at SSR. But Evans says the higher prices for those specialty products have also driven up the price of generic naloxone. Last week, President Trump's opioid commission, chaired by New Jersey Gov. Chris Christie, issued a report that included a recommendation to declare the opioid epidemic a national emergency. Doing so would give the Department of Health and Human Services the power to negotiate lower prices for naloxone, the report said. Today, HHS Secretary Tom Price said the administration believes they already have the resources and focus they need to tackle the problem without needing an emergency declaration, but he did add that "all things are on the table for the president." The report also asked the president to require every law enforcement officer in the country to carry naloxone.